Platformers are timeless. For as long as there are screens, there will always be games about objects scrolling across them. 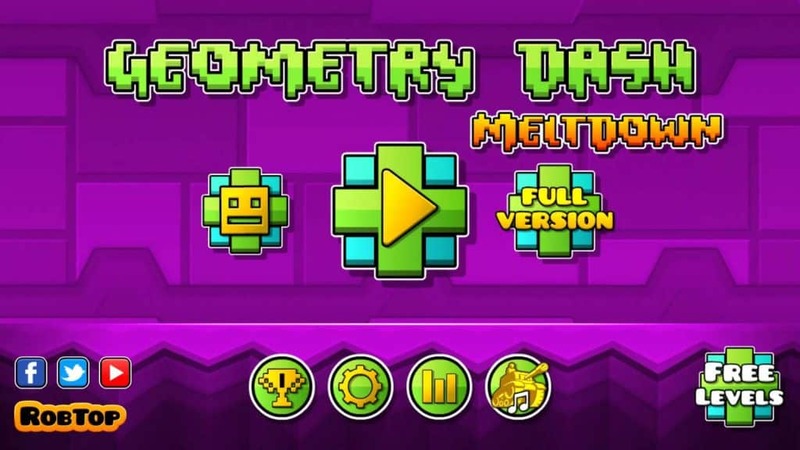 Geometry Dash Meltdown for PC is one of those games and is developed by Plonga for kids. 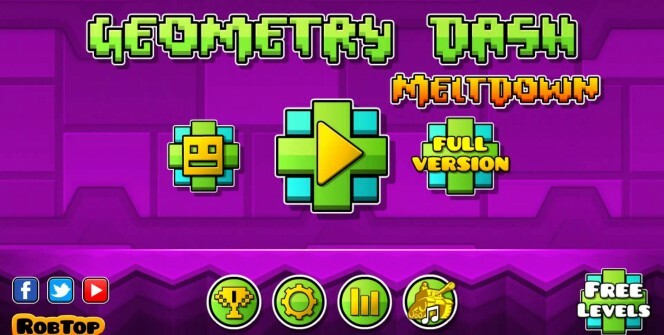 It is the follow-up to the immensely popular Geometry Dash. The aim of the game is to get the block from point A to Point B without letting it get punctured by the spikes in its way. You control your dashing square with a short touch for a quick jump and a long touch for high jumps to avoid spikes and reach ledges. Each level starts off simple and then the obstacles start to get tricky as the game throws in jump pads and gravity switches that have you crossing on the roof as well as a square ring that when dashed through gives you the ability to fly through the stage on a rocket ship. Sounds simple enough, until you start to play. Geometry Dash is mercilessly hard. You have to get through the entire level in one go. There are no checkpoints at any point in the levels so one mistimed jump means having to start the level again from the start. The developers were kind to let you know what percentage of the level that you cleared before you died so that you know how close you came, or how far you have yet to go. The only way to make it all the way to the end is to die several times along the way and memorize how to traverse particular points and what obstacles are coming up. Only the Gaming Gods can complete any of these levels on the first attempt. Thankfully the level restarts immediately after every death to keep the flow going. If they added a game-over screen after you die, you’d see it so many times you’d be seeing ‘game over’ in your sleep. Geometry Dash’s background colors and animations are one of its best features. Each level has a primary color theme however its hues change as you progress through the level or reach a particularly difficult area. The background design and gameplay are complemented nicely by the space-agey soundtrack with just the right tempo to keep you engaged. I just wish that the developers had stuck with same guy who did the music on the first Geometry Dash because in Meltdown the music is largely out of sync with the gameplay. 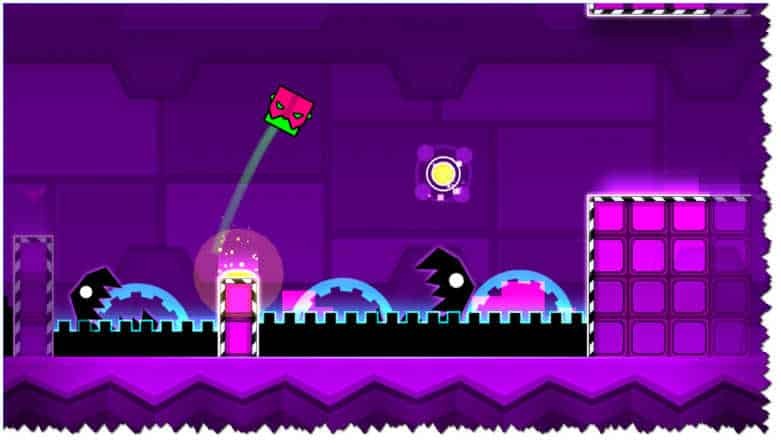 Players who purchase the full version are able to customize the shapes and colors of their block as well as create entire levels from scratch. Geometry Dash is a great game for all ages however it would be hard to predict which kids, if any, will have the resolve to stick with it until they can solve each level. Geometry Dash Meltdown for PC is designed to be challenging so its players will need to dedicate hours to playing and replaying it in order to reach the end. Some of the coins are so well hidden that even if you do struggle for hours there is no guarantee that you will achieve the levels that you aim for. Getting a perfect completion on every level of this game is nearly impossible which adds to its charm however some won’t be able to handle the frustration of having to start levels over and again before than can figure it but at least players have the option of moving on to another level if they’re finding one to be too difficult. The ship parts of the level give a good break to the monotony of just jumping and sliding. The game runs smooth however there are a few moments when the block does something implausible that results in a particularly frustrating restart. Sometimes when playing Geometry Dash Meltdown, bluestacks ask you fee to pay but gives you option to download some apps. Every time it asks you just select “Install apps” and continue using it free. I hope you enjoyed this guide, please rate and share. If you have problems running Geometry Dash Meltdown on desktop or any other issues, leave a comment below.